One-hand, one-step technique…they feature a counter-balanced door. Container provides security against tampering. Sharps Container 5.4 Quart is the next generation patient / exam room sharps collector. 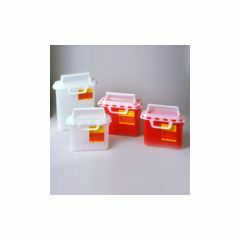 Sharps Container 5.4 Quart 10.75 in. x 10.75 in. x 4 in. Clear with horizontal entry. Counter balanced doors. Thank you Lori, You've been a tremendous help and I appreciate all that you have done to help my parents.